Wisdom of Life. : Surely this is not April Fool! Call me Robert Foo and not Robert Fool. Yes! Today is April Fool's day...a day to make some fun and to be fooled by someone. Also a day to test how tolerance you are when you are being fooled. Whether is April Fool, I practically take everyday as a fun and exciting day. Try me if you can! Back to some serious business. Yesterday while visiting a client at his office, he introduced me to one life insurance agent who was trying to sell to my friend. He is one of my competitor from another prestigious company in town. Quite a young person he is, who claimed he has sixteen years in our business and with a title of Unit Sales Manager. I introduced myself as life insurance saleman who has no title on my name card. Over a short discussion, he related an experience with us. One not so qualified lady agent from my company approached one of his established client for business. He was called to interview this lady instead by his good friend. As a sixteen years' agent he was, he asked some powerful questions that our poor agent could not answer. Defeated the frustrating lady, the sale was given to this happy man, I persumed. I smiled as he related the story. Perhaps he felt great with his achievement. I left both of them quickly, allowing them to continuing their chat without further distraction from me. Before I moved out, I patted my client's shoulder and said, "Mr Client, I believe you are speaking to an intelligent and committed life insurance agent here. His eyes and face show he is successful. If ever you intend to buy a million dollar insurance, he is the man to consider". The agent was caught by surprise with a compliment from another agent who has twenty seven years of selling. My belief in my career...never step another fellow colleagues who are in front and are trying to improve themselves. Instead of gaining strength and showing our muscle, help and assist that person to close the sale as well. This is not an April Fool remark. 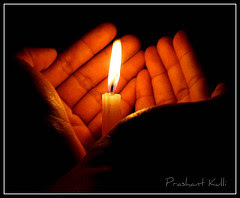 Food for thought - "A candle does not lose its light by lighting another candle, so light up the life of those in darkness".